What’s wrong with Market Street? Market Street is the main artery of San Francisco running 3 miles (4.8 km) east and west and connecting many neighborhoods and sites from Twin Peaks to the Ferry Building on the Embarcadero. In addition to the many pedestrians which can be found en masse on the street’s sidewalks, it is also a busy transit corridor for buses, light rail and street cars, and is dotted with Bay Area Rapid Transit (BART) stations that serve the entire Bay Area. Despite its chaotic environs, it is a popular corridor for cyclists as well. Market Street starts at Twin Peaks (bottom left corner) and runs to the Embarcadero (top right corner). Image courtesy of Google Streetview. 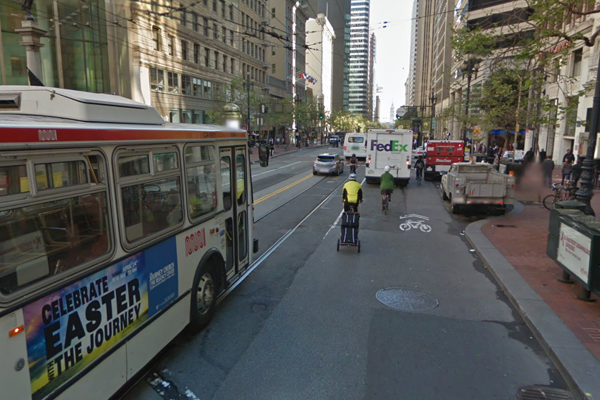 I ride through Market Street on a weekly basis, but it is never as comfortable as I would like and expect for this city. What makes up for the less desirable aspects of riding on Market Street is the great number of other cyclists that are riding there as well. When you are there with a group of fellow cyclists, you began to feel like you belong there as much as any other mode of transport and feel safer because you know that in a flock of cyclists, your visibility is increased to drivers. The stretch from Castro to Octavia Street has striped bike lanes. I think this stretch needs to be buffered because it is a moderate downhill ride going eastbound. See image below. Looking westbound on Market St. near Guerrero St. Image courtesy of Google Streetview. Now from Octavia St. to 8th St., the bike lanes are separated and protected like the photo below shows. 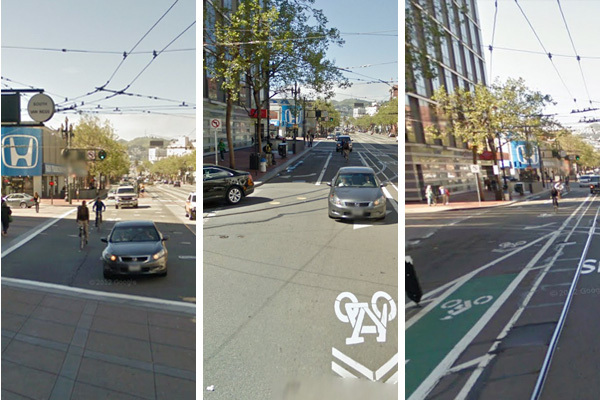 Protected bike lanes like those are what the cycling community is demanding to be implemented throughout Market St. Looking westbound on Market St near 10th St. Image courtesy of Google Streetview. But of course, the cycle tracks between Octavia and 8th are not ideal. 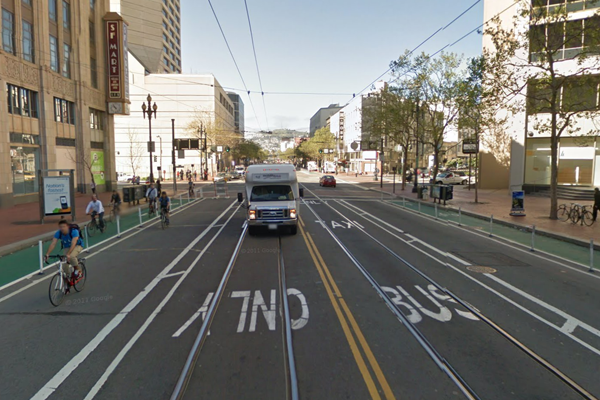 For example, there is one terrible 200 meter section between Van Ness and 10th St. in which cyclists have to intersect vehicles making right turns. 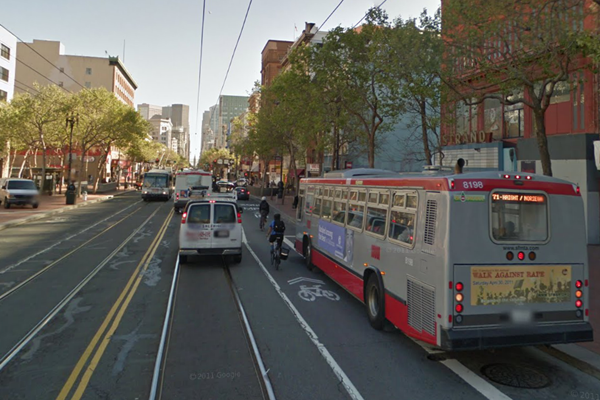 Making right turns on 10th and 11th Streets should be illegal for cars for safety reasons, but they are not. See photos below. 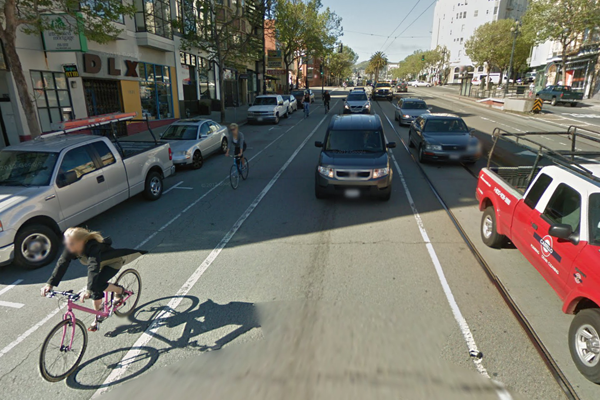 Left) Cyclists and drivers crisscross past Van Ness St.
Center) Drivers changing lane to make a right on 11th St. Right) Drivers changing lane to turn right on 10th St ahead. Images courtesy of Google Streetview. 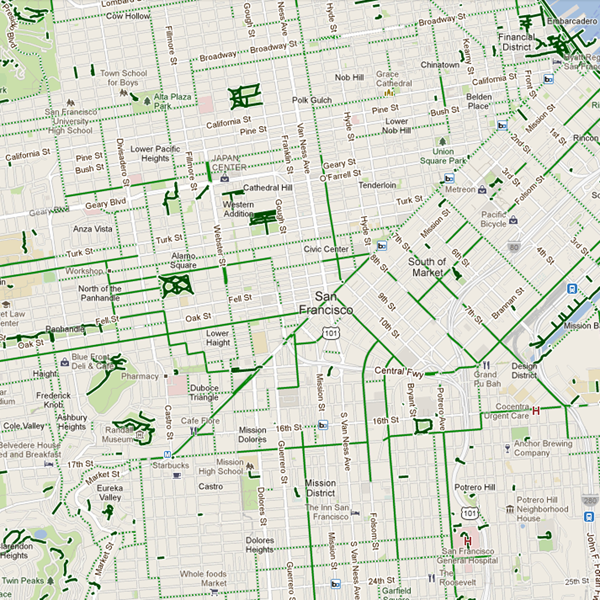 From 8th St. to the Embarcadero, there are no dedicated bike lanes. The street is just marked with bike sharrows as seen in the photo below. It is pretty pathetic. As you can see, all modes of transportation are crammed into four vehicle lanes. You have streetcars running on light rail, buses and shuttles riding on either of the lanes, cars and large trucks making right turns at intersections and tons of pedestrians crossing the street. And if that is not occupying enough of your attention, cracked pavement and potholes are in abundant supply. This part of the street is not for every cyclist- it’s for the bravest souls with survival skills. I call it the urban jungle. Just looking at the image below, you can see a major overhaul needs to be implemented as soon as possible. Looking eastbound on Market St. near 2nd St. Image courtesy of Google Streetview. Another example of the urban jungle-ness are the shuttles and buses pulling next to the curbs to drop off passengers which force bicyclists to maneuver around them, as shown in the photo below. Very dangerous. Looking eastbound on Market St. near 4th St. Image courtesy of Google Streetview. City planners have been talking about fixing Market Street for quite some time now, but now that has been hitting some roadblocks. I’ll talk more about that in another post.